Day 1 - We will pick you up from the Cancun International Airport between 12-1 PM (on arrival day). A private van will take you to our hotel (located at the marina). Day one is yours to prep cameras, visit downtown Cancun or just relax for your first day in/on the water. This is our 8th season taking a small group of divers out to see one of the greatest natural predation events in the underwater world...sailfish chasing baitballs around the warm waters that surround Isla Mujeres, MX. We will spend 4 days off Isla Mujeres, looking for sailfish hunting sardines. The sailfish hunt in packs, driving schools of sardines up towards the surface. Once they pin them there, the sardines form a baitball, which is when the sailfish begin their attacks. The frigate birds is what helps us find these events. The birds let us know what is happening below the surface. When we find them, we will jump in and try to view every predation event that we find. 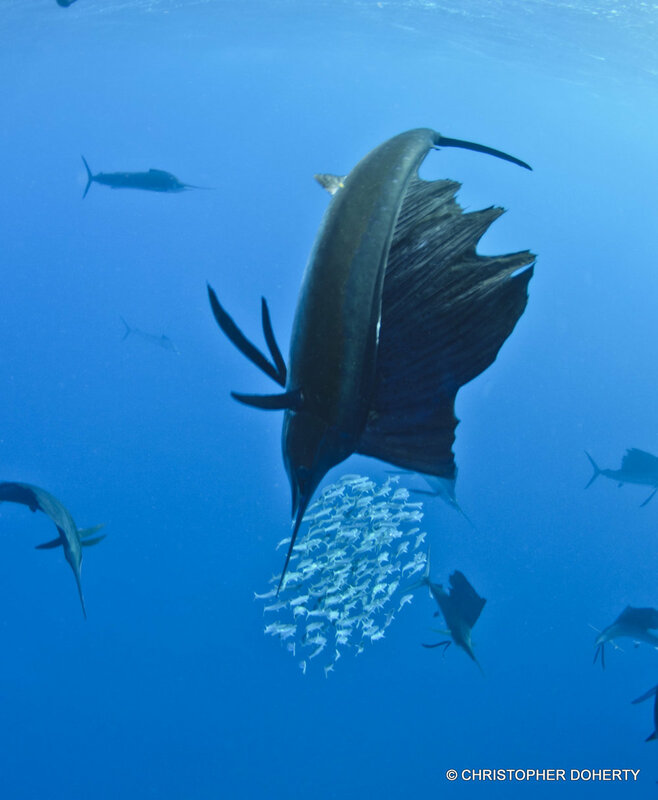 Sailfish are constantly moving, so the encounters will sometimes only last seconds or minutes, depending on the activity of the feeding frenzy. The ultimate goal is to find static baitballs. Which is a baitball that is not running, it stays in one spot. These are the opportunities we are searching for. When we find static baitballs we can spend minutes with them, or even hours with the sailfish, while they hunt. Each season we have been out there, we have managed to find static baitballs. Our personal record with one baitball has been 2 hour straight. On that day, we had enough time, to film for an hour, climb back on the boat, change batteries, then jump back in to film for another 45 minutes. This adventure is big animal diving at its finest. These are day trips and we will travel early each morning from our hotel, (located at the marina for easy boat access) in Cancun, Mx. to seek out sailfish. Spend our days out in the water, then return you in the afternoon back to your hotels. Please keep in mind that this is a natural encounter and there is a chance that we will not see any fish during our 4 days on/in the water. However we have chosen the peak season for our trip out to the sailfish hunting grounds, and we do have a very seasoned captain who knows these waters well. Let us know your interested in joining us. Thank you for your interest in our Sailfish Expedition. We will send you more information on this adventure. If you have any imediate questions, regarding the expedition, please feel free to call us, or send us an email.